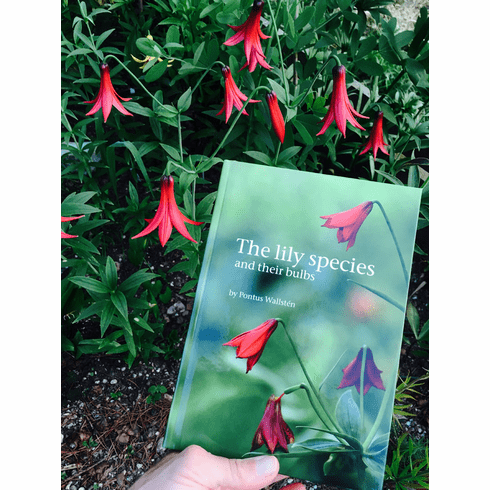 A virtual encyclopedia for the lilium species enthusiast, this book not only is a wealth of information including growing tips, it gives excellent photo examples of the bulbs produced by many of the species. These bulb photos are of extreme value in determining if you received 'L. regale' when you ordered 'L. brownii' for example. Not only does his book show photographs of 113 species covering the world, it also displays photographs of 69 different species bulbs. Included are also articles and contributions form various lily growers / experts from around the world that are wonderful. - A perfect gift idea for your lily enthusiast, Pontus would be happy to inscribe your special message and autograph your copy. Photo insert #1 is of inner pages of book showing 'L. bakerianum var. delavayi as grown by the author. Photo insert #2 is the author examining a stem of 'L. ciliatum' in Northeastern Turkey.